A Crowning Touch to Balboa Park: San Diego's Marston House ~ The History Girl! Tucked away on the northern edge of historic Balboa Park in San Diego, California is a large three story home, just a few hundred yards from a busy freeway at the bottom of a canyon. Although heavily wooded today, when the George Marston House was built in 1905, you could see snow-capped mountains on the horizon. Although not visible today, the manicured grounds and lush gardens compliment this Arts and Crafts style home, once home to a prominent citizen of San Diego and founding member of the San Diego Historical Society. George White Marston, who commissioned this home, appreciated city beautification and the need for green spaces. He was born in 1850 in Fort Atkinson, Wisconsin. Due to his father's chronic respiratory problems, his family moved to San Diego, California in 1870 in hopes of a better climate for his health. Marston first worked as clerk for a hotel and then entered the mercantile business. Marston and business partner Charles Hamilton operated a store in San Diego. He married Anna Lee Gunn, a teacher, in 1878. Together, the Marstons had five children. After his marriage, he and Charles split the store, with Hamilton taking the grocery side and Marston taking the dry goods. The Marston Company department store became very successful and remained in the family until 1961. With Marston's success, he became a prominent civic leader and was known for his philanthropic work. As early as 1872, he and Charles Hamilton opened a free reading room, the predecessor of the San Diego Public Library. He was also involved with the establishment of the Benevolent Society of San Diego and the YMCA, and was an active member of the Presbyterian Church. In 1907, he purchased forty-acres surrounding historic Presidio Hill in order to preserve it. He ended up building a private park and museum on the grounds and donated it to San Diego in 1929. In 1928, he founded the San Diego Historical Society and served as its first president. He also raised funds and donated his own money to buy land for Torrey Pines State Reserve and Anza-Borrego Desert State Park. During his travels to large cities across the country, Marston viewed many urban parks, which inspired him to advocate for the creation of Balboa Park. Marston hired architect John Nolen to develop the first plan for the park in 1908 and a more-detailed plan in 1926. Marston also served as chairman of the Buildings and Grounds Committee for the 1915 Panama–California Exposition in the park. Marston House dining room with built-in cabinets and Gustav Stickley sideboard. 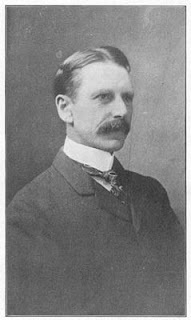 Politically, Marston served on the city council from 1887 to 1889 and ran for mayor unsuccessfully in 1913 and again in 1917. In 1904, Marston purchased property to build a house. The design of the house reflects the influence of both the Prairie School and the Arts and Crafts movements. However, the original plans developed by Irving Gill and William Hebbard called for a house built in the old English style with stucco and half-timbering on the second floor level. On the interior, there were to be large fireplaces, low ceilings, and window and hearth seats. But unlike architectural firm Greene and Greene based in Pasadena, Gill did not design the total environment for his clients. Between the time the plans were developed and construction started, Gil had travelled east for several months to oversee other projects in Maine and Rhode Island. It is believed that he stopped in Chicago in between and was influenced by the new Prairie style of architecture. 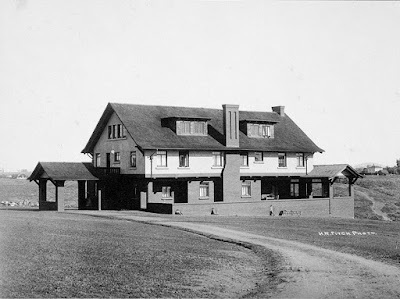 Marston House, circa 1905. Source: HABS. Upon his return to San Diego, construction had started on the Marston House but a few changes were made. The most significant and noticeable deviation from the original blueprints was the removal of the Tudor-style half-timbering on the second level. By removing this, it gave the house a more modern design. On the second floor balconies, they were constructed of wood rather than brick. Ernest Pefley, a general contractor in San Diego, built the home. George Cooke designed the landscaped canyon and formal gardens surrounding the house, beginning in 1906. Because of the hard mesa rock, holes for all the trees were blasted with dynamite. The Marston family moved into the home in October of 1905. The total cost of building was reported to total $20,000. George and Anna Marston lived in the home until their deaths in 1946 and 1940, respectively. Very few changes or upgrades were made to the home during their residence. Upon George's death, the home was left to his daughter, Mary. Mary continued to live in the house she grew up in until her death in 1987. Upon her passing, the home and grounds was deeded to the City of San Diego and was to be used by "the San Diego Historical Society as its headquarters and as a center for the development of recreational, educational, cultural, social, and historical activities beneficial to the general public." The home became a museum in 1987 and since 2009 has been maintained by the Save Our Heritage Organisation. Today, it is open regularly for tours and the restored gardens are open to the public as part of Balboa Park. The rooms of the house are furnished with a variety of different pieces designed by Gustav Stickley, L. & J.G. Stickley, and Charles Limbert. Throughout the home you can view many of the original innovations designed by Gil such as raised thresholds to keep rooms cleaner, solar heating, numerous pieces of built-in furniture, and interior windows that bring light and fresh air into closets. Save Our Heritage Organisation has worked diligently as the site's steward to restore the home and the grounds to their former beauty as part of the park that Marston helped build. One can only imagine what the founder of a historical society would think knowing that his home has been preserved in perpetuity as a reminder of all his contributions to San Diego. Wow, I've been to Balboa Park a number of times but I never knew about this house! I love Arts & Crafts style, I definitely have to check it out next time I'm there.